Experience the C & C difference. Our commercial care specialists can work with you to manage your environment and meet your needs and budget goals. Don't be fooled by a lower price offer. An inexperienced contractor can cost you dearly down the road. Improperly pruned trees could suffer irreversible damage and necessitate early removal and replacement. 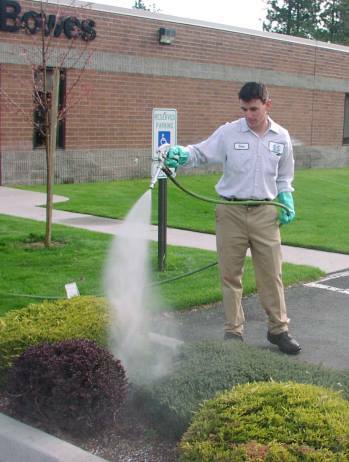 Application of incorrect herbicides may damage lawn, trees, shrubs and bushes permanently. Your landscape plantings are much too valuable to be left in the hands of an untrained "professional". Why gamble with another contractor who may cause permanent damage and actually reduce the value of your property. 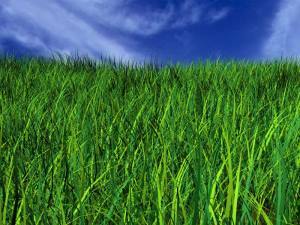 Let our years of experience and trained technicians care for your lawn, plants and trees. Inexperienced sprinkler repair personnel can take two or three times as long to "fix" a problem. And how about the time they spend running back and forth to buy parts because they didn't have what they needed on the truck? Are you being billed for that time? There is no value in a cheap hourly rate if the technician is not knowledgeable in irrigation and does not carry a wide selection of parts. Our irrigation technicians have a minimum of 5 years experience in irrigation repair. We invest in hours of outside training courses each year. Our dispatch trucks are set up for efficient service and are well stocked. And if we do not have the part you need on our truck we won't bill you the travel time to go get it. Let the irrigation professionals at C&C Yard Care maintain your sprinkler system. Incorrect sprinkler adjustment and sprinkler timing can waste hundreds and even thousands of dollars and vast amounts of water over the course of just one watering season. Our experience is our value! Personalized service -- your commercial sales professional is always just a phone call away. We will routinely inspect your property to ensure things are looking their best. Convenient billing options -- we can invoice over a level 9 or 12-month billing plan or simply at the end of each month for actual services performed. Experience --- we have been serving the Spokane area since 1985. We have experts in each area: Mowing, Pruning, Irrigation, Fertilizing, Weed Control, Tree Care, Snow Removal. Dependable --- We maintain a large fleet of vehicles and equipment to service your property quickly, effeciently and professionally. Should a breakdown occur, we are prepared to dispatch another crew to get the job done. Full service care -- We provide all service work in-house. 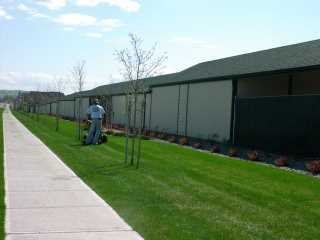 From mowing, pruning, sprinkler repair, fertilizing and weed control, tree & shrub care and snow removal. We are your single source solution. We can also provide landscape design ideas for renovation & enhancement. All products or services are taxable as required by your city or county.